PM Netanyahu flies to Paris, Brussels, with a clear message for Europeans. 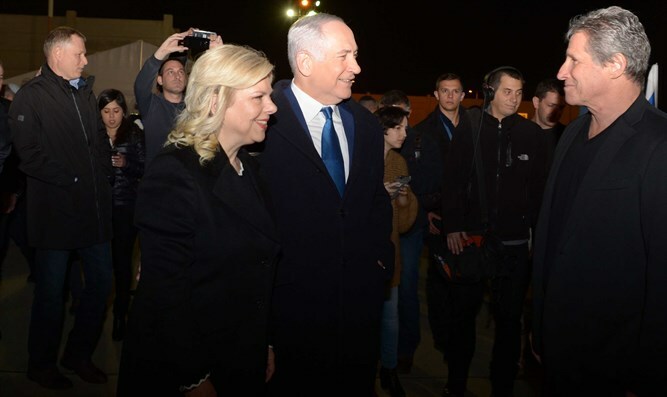 Israeli Prime Minister Binyamin Netanyahu on Saturday night spoke with media prior to his departure for diplomatic meetings in Paris and Brussels. "I am leaving now for Paris and Brussels," Netanyahu said. "In Paris, I will meet my friend, French President Emmanuel Macron. Afterwards, in Brussels, I will hold an important meeting with European foreign ministers." "This is the first time in 22 years that an Israeli prime minister has held such a meeting. "I ascribe great importance to Europe, and I respect Europe, but I am not willing to accept its double message. I hear from Europe condemnations for US President Donald Trump's historic declaration, but I never heard condemnations of the rocket attacks against Israel, which occur as a result of the horrific incitement against us. "I am not willing to accept this hypocrisy, and as usual, even in this important forum, I intend to present Israel's truth, without fear and with my head held high." Gaza fired four rockets on Israel Friday night, disturbing locals who were enjoying their Shabbat dinner. One of the rockets fell in the Gaza-area town of Sderot, causing damage. Tags:Netanyahu, Paris, Brussels, rocket attacks.